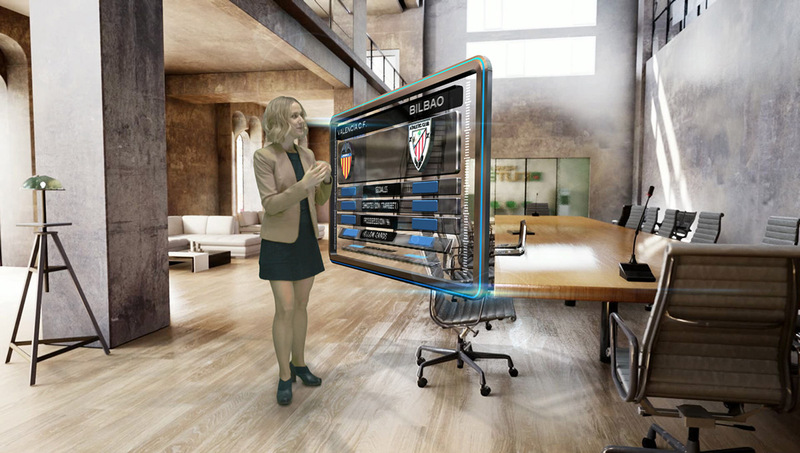 In Augmented/Mixed Reality projects, the seamless integration between the real and virtual objects and environments becomes essential to ensure the viewing experience the audiences expect from any broadcasted content. This not only involves high quality rendering of scenes and objects, but also requires the perfect integration of the different elements on the scene to provide a sense of realism, with precise perspective matching and correct broadcast continuity. And as users are used to 3D scenes, synthetic objects and virtual reality applications even in mobile platforms, the quality of the rendered objects/scenes and the seamless integration with other elements such as data driven graphics is now critical for the audience. Gaming engines achieve excellent rendering results for background scenes, allowing for realistic results on scene environments. But Augmented Reality broadcast applications also require the interaction between sets, talents and virtual objects, many of them created out of external data sources such as statistics, charts, bars, and many other, which should be rendered using real-time broadcast render engines as they are optimized for such applications. Both approaches, when combined, allow for visually engaging representations of the data which can then be better explained by the presenters on the set. Along with advanced rendering features such as PBR (Physically Based Rendering) or HDR (High Dynamic Range), Brainstorm supports 3rd party render engines, with special interest in gaming and architectural engines such as Unreal Engine. These highly complex engines, played along with the eStudio render engine, allows Brainstorm products, such as eStudio and InfinitySet, not only to show excellently rendered realistic background scenes, but also to integrate data-driven graphics in the final scene, like 3D motion graphics, lower-thirds, tickers, CG and many other elements. With the inclusion of these graphic elements, scenes can result in highly complex compositions, seamlessly integrating in real-time virtual 3D backgrounds, real characters and synthetic graphics elements. And when combined with the advanced PBR and HDR rendering features of the eStudio render engine, it is possible to match the rendering quality, materials and lighting of the data-driven graphics with those rendered using the 3rd party engine. Brainstorm’s approach to external render engine support is unique in the industry, as it combines its renowned eStudio render engine with Unreal Engine using a single machine. This approach features a strong integration that allows InfinitySet to control Unreal Engine’s parameters in real-time, as opposed to other solutions which rely on several machines to render the different scenes and graphics to later combine them in a given environment. Most importantly, Brainstorm’s approach for merging both engines’ render parameters and buffers, makes them work as a single render engine, and working in a single machine (Combined Render Engine). This simplifies setups as it does not require additional hardware such as studio mixers, and can be easily integrated into any broadcaster’s existing installation. To achieve this, Brainstorm products such as eStudio or InfinitySet control, from their own GUI, different parameters of Unreal Engine’s Scenegraph (World Outliner), including camera parameters, via the parameter’s ID. Brainstorm does this by converting Unreal Engine’s World Outliner list into a Brainstorm list and exposing the equivalent parameters in the Brainstorm interface. Unreal Engine’s render buffers are transferred to the Brainstorm engine in real-time, allowing the combined engine to add the chroma keyed talent, the data-driven graphics and other elements. InfinitySet’s TrackFree technology allows for using tracked, fixed cameras or any combination of them to shoot the talent on the set, indistinctly using internal or external chroma keyers. When using fixed cameras, InfinitySet can move the scene rendered by the Unreal engine, by using the internal mixer’s camera presets, and then providing the final composed output which can be altered at any time in real-time. This approach also allows to take advantage of the extensive libraries of 3D models and elements created and made available for these 3rd party engines, providing additional opportunities for operators and designers to create their programs. For more information on Brainstorm and InfinitySet, visit the Brainstorm website here.